HomeWorld NewsWho is lobbying for the TTIP agreement? Who is lobbying for the TTIP agreement? The terms of the TTIP between the EU and the US will bring about big changes for the trade between those big players, however will also mean changes for many sectors that we might not be thinking about right away. Information about who is lobbying for this trade agreement came to surface and it seems rather shocking and surprising which companies and organizations play a part in the negotiations. On the other hand, we the European Citizens will be the ones effected by the agreements, so shouldn’t we be the ones negotiating the terms? It seems that corporate lobbyists, paying hundreds of thousands of Euros to push a big business agenda in Brussels against our votes and opinions. The biggest increase in lobbying spending came disturbingly from big pharma and the finance sector. This is especially disturbing when it comes to food diversity and health, as big pharma concerns can have a big influence on our health and nutrition. 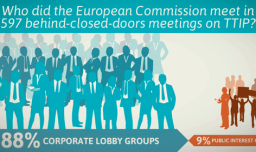 Take a look at these infographics that shed light on some shocking facts about the corporate lobby groups fighting for big power behind closed doors in Brussels.